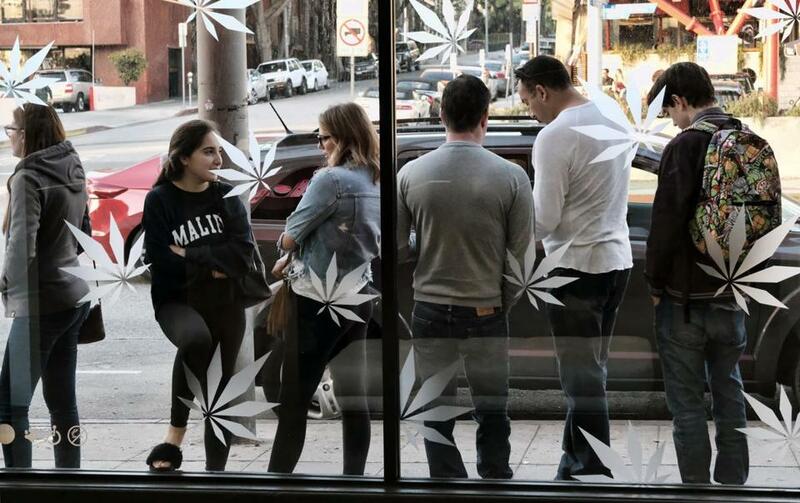 Customers line up for recreational marijuana outside one of MedMen&apos;s marijuana dispensaries in Los Angeles. Good news for toking tourists on their way to Boston: There’s a new collection of marijuana-themed short-term rentals in town, ready to uplift visitors in ways chain hotels cannot. Chocolate on your pillow? That’s so pre-legalization — try a lozenge infused with the cannabis compound CBD instead. Tiny bottles of shampoo? More like tiny bottles of hemp-infused shampoo. A book of coupons to local restaurants on the desk? Replace “local restaurants” with “local dispensary” and you’re starting to get the idea. These are the offerings at roughly 200 furnished apartments around the Boston area now available for rent from 420 Suites, a spinoff of corporate rental firm Northeast Suites that’s launching this month. In addition to a basket of cannabis-themed gifts, the company will offer chauffeured transportation to and from its rental units — in the Back Bay, Fenway, downtown, Longwood, and East Boston — and the Revolutionary Clinics medical marijuana dispensary in Somerville. Guests get discounts, help registering as a medical marijuana patient, and educational materials about various cannabis products. There are even plans to offer in-suite massages with infused lotions. There are, of course, a few catches. For one, recreational marijuana sales haven’t started just yet; for the moment, only registered patients can shop at Revolutionary Clinics, and getting a doctor’s recommendation and state card can take a couple weeks. Second, other than a handful of apartments in East Boston, most of the units available from 420 Suites don’t actually allow smoking. And because smoking pot in public is not allowed (punishable by a $100 civil fine), most canna-tourists will be limited to edible and other nonsmoking THC-infused products. The state Cannabis Control Commission earlier this year decided to defer licensure of so-called social consumption businesses — such as cannabis cafes — where consumers could use marijuana together. That has led to complaints that renters, public housing tenants, and tourists have nowhere to legally use a legal product. Flynn readily acknowledges those limitations and says 420 Suites is mostly positioning itself to dominate the coming recreational market, the advent of which should make it far easier to connect visitors with pot. Eventually, the company plans to expand into Maine and Washington, D.C.
Other firms are also considering the potential for cannabis-related tourism, which has emerged as big business in Colorado, Oregon, and other states where the drug is legal. One is CTM Media Group, a large marketing firm that prints cards and brochures advertising various tours and attractions — ubiquitous at tourist-heavy spots such as Logan Airport, South Station, Faneuil Hall, and hotel lobbies. Brian Bradbury, CTM’s director of tourism sales and marketing in the Northeast, said the trick will be finding a tasteful way to catch the eye of visitors who are interested in marijuana without raising the ire of the property owners that host its racks of brochures. And like 420 Suites, CTM is contending with the dearth of legal spaces where consumers can smoke marijuana. Another issue: State regulations say licensed marijuana shops can only market in media whose audiences are at least 85 percent adults older than 21. That means CTM can’t simply leave a stack of pot brochures next to family-friendly pamphlets advertising duck boat tours and the Freedom Trail. One option is to work with marijuana websites such as Weedmaps and Leafly, which provide directories of pot businesses but aren’t licensed themselves. Bradbury said CTM’s marijuana business in the first year of recreational sales might only total $250,000. But, he said, the company expects to make double that in the second year, and he believes the cannabis tourism market will skyrocket soon after — surpassing even its revenue from breweries such as Boston Beer, the maker of Sam Adams.